The biggest thing that has occupied my life in the past week is my poor little kitty. I lost my 17 year old kitty, A.J. in March (the night before my granny was admitted into ICU). At first I said I was going to wait awhile before I got another cat, but I only lasted three days. It was just too strange around the house without a kitty. I've had one for so many years. Anyway, I checked out specific breeds on-line and then found petfinders.com and found an Ocicat (a breed that I was interested in) at the South Brevard Animal Shelter. We went there, but he was very rough and actually ripped my hand open. (I have a scar from it.) So I decided it was better not to take that kitty since I have small kids. When I went to put him back in the cage, there was a orange (red) tabby in the cage above him. I got to looking at him only because he looked like A.J. and I started crying. Well, he started purring and rubbing against me and so I had to take him out of the cage. Well, that was it. From that moment on he was mine. This particular weekend was right before spring break and the vet who does the spaying and neutering was going to be gone for the week so she could be with her kids. I totally understood, but I sure was unhappy that I was going to have to wait a week before I could bring him home. Mary, who handles a lot of the adoptions and the website, offered to let me take him home as a foster cat and we arranged for me to bring him back to be neutered once school let out. The night I took him home, I noticed that he was limping. He was favoring his back left leg. (They didn't have a socialization room for cats, so I never saw him walk at the shelter.) I immediately emailed Mary to let her know. I didn't want them to think I had done something to him. So about 3 or 4 weeks ago, I took him in to be neutered. I spoke directly to the vet and explained to her about Butterscotch's leg. I told her how he ran and jumped and never acted like it hurt, except for the limping and sticking his leg out slightly when he sat. When I went to pick him up that afternoon, I was told that he had a stretched tendon or ligament (can't remember which) and that it was probably an old injury and that it was probably something he would just live with and had learned to adjust. Okay....so I take him home. Then a couple of days later I made an appointment to have my vet take a look at him and put in an id chip (which I had requested at the shelter, which they offer, but they didn't do it when he was there). I explained to my vet about his leg. Doc started messing with his hip and said, "There's something wrong with his hip. Feel." I felt and I could feel it pop in and out. Doc suggested giving him a couple of weeks to see if it got better and then if it didn't I could bring him in for xrays. I told him then and there, let's do it now. I've had him since March and there has not been any improvement, so I had no reason to believe that there would be any in the couple of weeks. So Doc agreed and took him back for xrays. He came back with the film...and omg!!!!! The ball part of his femur bone was completely broken from the long bone!!!!!! How he has managed to get around and run and be so sweet and tolerant is beyond me. I'll never figure it out. So last Thursday he had surgery. Now this buger, started pulling out his stitches yesterday morning. So I took him back in and they stapled the half that he had pulled out and gave me a collar to put on him. Well, that stinker can get out of that collar. I tried tying it on numerous ways and as tight as I could without choking him and he got out of it every time. It's also like a catch 22, 'cause when he has the collar on, he tumbles and flails all over his crate (which he has to be contained for 10 days) to the point that I worry that he'll seriously damage his hip. But if I don't put the collar on he picks at his stitches. Well, last night he had managed to pull out the remainder of his stiches and one of his staples!!! The incision was completely gashed open and I could literally see the muscle. So as if this hasn't cost enough already, I had to take him to the animal ER at midnight to have it cleaned and stapled. They also gave him a shot of antibiotics to be on the safe side. They also suggested giving him some children's benedryl to help calm him down. So I had to make a trip down to the closest 24 hour Walgreens at 1 in the morning. Anyway, they bandaged him up tightly to keep him from biting at his stitches. I asked them if he was going to be able to use the bathroom..well litter...and they said oh sure. Well, I had my annual check-up this morning, ran some errands and when I came home his back end was covered in feces and urine!!! My poor poor baby! I took him in to my vets office, where he was pretty disgusted at the condition he was in. He cut his bandages off, took him back to bathe his back end. He did think they did a nice job stapling him. They put lots of staples and put them really close together, so if he does manage to get one out, there is still enough to keep his skin together. He also gave me some meds to kind of keep him calm. He's not zonked out, just feeling real good. 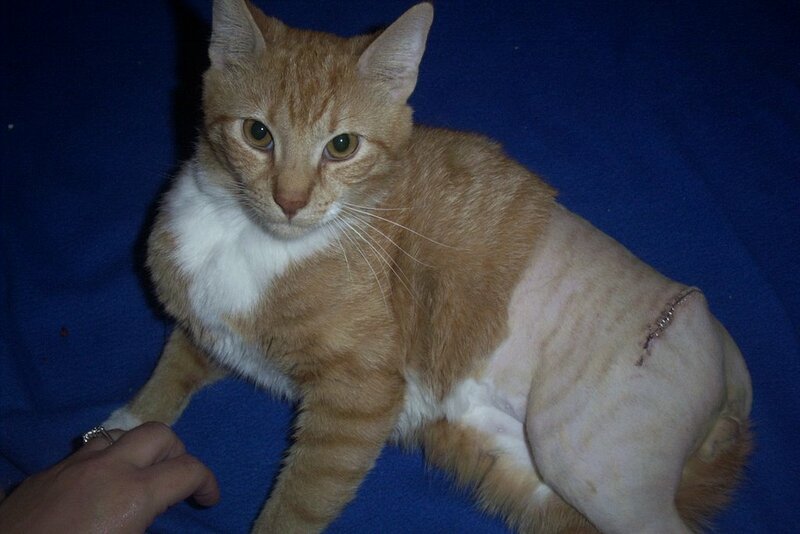 Here's where my frustration comes in...how could the shelter not know that there was something seriously wrong with this kitty's leg? I mean, I wonder how long he had been sitting with a broken hip? Then even after I talked with the vet directly, she comes back with some half-baked diagnosis. I realize that they have limited funds, but good night, they should have said to me...we don't have the ability to xray and we think he should have an xray to rule anything serious out. Looking back I'm glad we didn't know that there was a hip problem, or we would never have adopted him. In fact, I had told Mary when we were looking that I didn't want a cat that would have to take medicine or had any serious ailments, just because we had just dealt with A.J. and his hyperthyroid issues. But, just since I officially adopted him, maybe 4 weeks ago, I've been hit with about $700 in medical expenses, some voluntary, like his neutering and id chip, but most not. Granted that's less than it could have been, 'cause we're fortunate that our vet is best friends with my father-in-law and does a lot for us either for free or at a discount, but still!! Of course, now we don't have any other choice but to take care of him. He is just the sweetest cat I've ever had. My son carries him around like a rag doll and he just chills. The only agression I've seen out of him is towards our lab. But he's over that now, and thinks Zoe's tail is a cat toy. I'll update (sure I will) as he progresses.